OUR MOTTO…HAPPY GUESTS, HAPPY OWNERS, HAPPY US! Oceanfront or beachfront, nicely decorated and staged, updated, great value, well stocked, great amenities, immaculate, comfy, personalized Aloha (friendly) service, arriving happy and leaving happier! Peace of mind, well cared for condo retreat (babied)! Enjoy your own vacation without having to spend all your precious time – shopping, repairing and cleaning. Have happy guests, returning guests, referrals, bookings upon bookings and maximized revenue…Success! 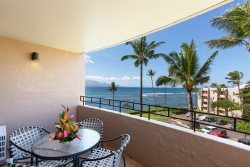 Why I Go Maui Vacation Rentals & Realty for your property management needs? Because we are NOT like the others. We have that extra special something that all the others don’t have and the best thing that we do is take excellent care of you. We have over 15 years of vacation rental management experience, providing better than exceptional care of owners, their condos, and their guests. We started with our own vacation rentals, building a great reputation and a formula for success and now extending our services to you. We are a State Licensed Full Service Vacation Rental Company specializing in the Maalaea area. Our clients find us usually by word of mouth as we have never marketed our services directly to the community. We limit the number of clients that we service so we can keep high-quality standards. Now that you are in the vacation rental business or thinking about it, you will soon learn that the care and maintenance required is time-consuming, to say the least! Hiring a reliable licensed property manager can help take the burden of management away and provide the much-coveted peace of mind, leaving you time to enjoy the benefits provided by your investment. We promise exceptional service like no one else in this industry – Quality Service that wholeheartedly meets our company motto – Happy Guests, Happy Owners, Happy Us and we are confident that owner’s and guests overall are just that…Happy. Our focus is a successful strategy for strong bookings to maximize owner revenue, to encourage returning guests, great referrals and reviews, and provide quality, detailed care of the owner’s investments and to the guests who are lucky enough to enjoy them. We keenly focus on guest’s satisfying experience from start to finish. We effectively communicate and work closely with owners especially newcomers to the vacation rental world for easy transitioning regarding all aspects of the business, patiently answer questions and hold hands for as long as they have needs. Once an owner partners with us we provide “Free of Charge” the sometimes much-needed staging consultation and set up making sure your condo is appropriately presented and well equipped for vacation rental “success”. Owners always have the right heart but don’t always have the right idea but we do, we have the formula… (we know what makes the guest happy) and happy equates to…”SUCCESS”! Are you ready to start enjoying success with our on-island peace of mind service? To learn more about our great vacation rental management program please contact us for a complimentary consultation.